This month, the big news is a Mars-Pluto conjunction in Capricorn, in effect from November 1st through November 18th, but most intense on November 10th and 11th. At the same time, we have lots of Scorpio (water) energy all month. For the majority of November, The Sun, Mercury, Venus, and Saturn will be located in Scorpio. With Mars and Scorpio still prevalent, just as they were in October, we are dealing with the phoenix archetype. Mars-Pluto conjunction is like a volcano in an earth sign, its lava dissolving whatever is in its path, with possible eruptions to boot. We can empower ourselves by allowing what is bigger than we are to usher us into our next level of consciousness, like a phoenix will rise from the flames of a fire. As Mars (action) touches Pluto (deepest transformation) during the next few weeks, and the Sun illuminates Scorpio energy (deepest tests and questions), allow your unconscious to feed you messages through your environment, your body, and your visions—or however you receive information. A conjunction aspect can make you feel like things are urgent and you have no room to breathe. Trust me, sometimes the best thing you can do when this urge hits is to breathe and do nothing! Wait until you feel a decision is sound before you act—that is one of the Scorpio “tests” before us all right now. Can we be patient in the face of urgent desire to make things happen in our time frame? Can we honor and respect divine timing? Saturn, after all, is making its last movements through Scorpio and if the heavens did not set up a time of testing, well, it just wouldn’t be a Saturn in Scorpio transit! By reaching into the depth of your wisdom and listening to the better angels in, well, every matter before you, you will emerge victorious and truly have something to be grateful for at Thanksgiving—which can be as simple as holding your tongue to avoid hurting someone you love or holding your pocketbook to avoid spending too much on something extravagant that you think you need in the moment. Insights will keep arriving in a steady stream as Pluto will move into exact aspect with Uranus again during the next few months, fostering honesty and integrity in all our lives. The Taurus full moon on November 6, as the month opens, is a nice time to prepare for these changes. Any ritual or activity that engages our senses to help us take stock of where we are at is a good idea. Let yourself indulge and rest on this full moon, enjoying the senses and honoring your physicality. Interacting with nature is always a good idea for body and soul. On November 8, Mercury enters Scorpio and we can feel our thoughts deepen accordingly. We might turn toward metaphysical practices and prayer and meditation even more ardently during the Mercury transit in Scorpio, and that would be a natural and healthy tendency at this time. It can be a solace and produce great abundance for our hearts and minds. On November 16, Neptune turns direct in Pisces, adding to our ability to connect with the divine, allowing us to move forward in our spiritual paths once more. If we have felt our energy or connections blocked, we can expect to feel ourselves cleared and awakened again. If we have had any troubles with sleeping, dreaming, or over-indulgence, we can make great strides again now that Neptune has resumed forward motion. This spiritual support is further enhanced when Chiron turns direct on November 23. Healing of all sorts is covered by Chiron. If we have been suffering or stagnated, or if we have been having trouble finding help or mentoring, or been cut off from help or mentoring, this should be resolved after Chiron turns direct. Conversely, this also opens up the possibility of life bringing to the forefront any situations that require healing, since healing requires a wound or situation to be healed, so Chiron also covers the cause portion of the cause and effect nature of wisdom acquisition—the original wound. Right before Chiron turns direct, the Sun enters Sagittarius, and the mood shifts into one of exploration and expansion. Learning, teaching, traveling, and all things of the world come into focus, and we can open up a little more after the Scorpio season. We may see a shift from an internal month to a more social and external month ahead. The Sagittarius new moon is a time to meditate on where you would like to travel and expand your life. It’s a good time to focus on Jupiter—the great protector of our solar system—and to make a wish to this benefactor for something that will bring you joy. Of course, this energy can be used for simple thanksgiving and appreciation as well, as many of us do not have very much to wish for. This life is already a dream come true when we look around and see the many wonders and miracles and amazing people who surround us each and every moment. This month, we are making a 4-card spread. The first three cards are to guide us for 1) the first ten days, 2) the second ten days, and 3) the third ten days. The final card 4) will give us a theme for the entire month of November. We are using The Crystal Tarot deck, so you can meditate with the crystals indicated on the cards during the month, as well! One of the ways to meditate with a crystal is to carry it in your pocket and clasp it with your hand throughout the day, allowing it to absorb energy from you. Another way is to place it in your home or on your desk in an honored place, and allow your eyes and mind to drift toward it gently throughout the day. You can also sit with the crystal / stone in formal meditation for at least 15 minutes a day. 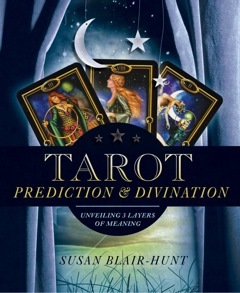 This is a demonstration of how you can create a Tarot card spread of your own, using the cards flexibly. You do not always have to follow others’ layouts. One of the nicest ways to learn Tarot is to make up your own card layouts—and simple is the best for learning. Enjoy! The Empress and the crystal EMERALD: The best kind of mothering and creativity arrives in early November. What a great time to do any DIY holiday gifts and prepare and plan for the upcoming season of celebration! This is a time to relax and enjoy everything around us. This looks like the brightest and best time of the month! Seven Of Swords and the crystal AMBER: Well, the folks who are interested in credit card theft will be doing their thing to prepare for the holiday shopping season during mid-November. You may want to use cash this year instead of charge your purchases, as this form of theft is indicated. We can carry amber in our pockets to help protect ourselves some, but things are pretty wild out there in the transaction world! This is a reminder to be smart as much as possible. It may be nice to relax a lot during the middle days of November, pulling back your energy. Knight of Pentacles and the crystal BLUE TOPAZ: This looks like the busiest time of the month, so I hope there is a lot for you to celebrate as you begin holiday preparation and family gatherings in earnest as December approaches! Card 4: Theme for November! King of Pentacles and the crystal GOLDEN RAY CALCITE: This card verifies that meditating with stones and earth-elemental objects is a good idea during November. Chakra balancing can be very beneficial focus for us spiritually-minded folks. Anything from working in the garden—whether that be cleaning up or preparing a winter garden—to clearing space in the home is indicated. Creativity and grounded projects such as sewing and cooking, or any fun and enjoyable activities can be explored successfully. Nature can be very rejuvenating! Overall, all the cards tend toward creativity, relaxation, finance, and home/family/relationship/celebration focus. Taoists say: To the caterpillar, it’s the end of the world. To the master, it’s a butterfly. When we observe that we are transforming, we often experience fear as part of the process. One of the most interesting experiences I had last year was a dream in which I drove over a cliff so tall I could not see the bottom even as I was experiencing the fall over its side in my Rav4. When I woke during the fall, the heart in the center of my life was pounding. For days, the sense of falling returned repeatedly, my stomach tumbling over itself at the oddest moments. As I relaxed and asked myself and others about this physically and psychically intense dream, I learned these types of dreams happen at points when our unconscious minds send up messages that we will no longer be going back to identify with our old personalities. We will only be going forward. In transformation, things change for good even if we cling to the belief that we can revert back to our old actions that helped us feel secure previously. In our new identities, we need new habits that build our better strengths. Instead of the caterpillar crawling across the landscape of my former life, I needed to meditate each day to develop a butterfly’s wings to use to fly while falling! This is a hearty soup that can be made vegetarian by swapping out the beef stock with vegetable stock. 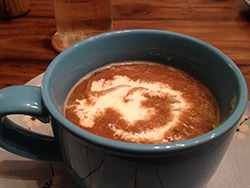 It gives a nice kick to a savory beet soup by including New Mexico Green Chiles. In my case, I used fresh and sautéed them, but you can just as easily use roasted, chopped green chiles or a jar of green chiles. It all depends on the season and what is available in your neighborhood. My neighborhood happened to be the kitchen garden outside the back door. Yield: Serves 6 or more large portions. 1 cup Plain Yogurt to swirl in each bowl upon serving. Prepare Beets: To prepare the beets, dispose of the greens/stems, and cover them with water in a non-reactive pot. Bring the water to a boil and then reduce the heat to low, boiling them softly for at least an hour and a half. Depending on how large they are, you may need to cook them even longer. I’ve cooked beets for 3 hours on the stove! You also may need to add water to them to keep them covered in liquid while they cook. (Non-reactive pots are generally stainless steel or glass.) When they are properly cooked, handle them with disposable kitchen gloves so you don’t stain your hands. The skin peels off and the beets are soft and easily sliced through the middle. In this recipe, we’ll be putting them through the blender, so you can peel them and then slice them into approximately 1 inch cubes. Set aside in a non-reactive bowl. Prepare potato: To prepare the potato, you can peel it and chop it into 1 inch cubes. Then boil the potato in a small pot for about 30 minutes until it is soft. Alternatively, you can boil the entire potato alongside the beets for a longer period and then chop it. Prepare soup: In a large Dutch oven or soup pot, melt the butter over low heat. Slice the onion in thin cross-sections. Dice the green chile. Turn heat to medium and add the onion and green chile. Cook them while you blend the other ingredients. In a blender, a little at a time, add some of the beets, potato, water, and stock. Liquefy and then pour over cooked onions and green chiles. Blend batches until you have added all the beets, potato, stock, and water. Add pepper to the soup. Bring the soup to a low boil. Then turn heat to low and simmer for about 15 minutes. Serve in large bowls with a swirl of yogurt on top. Homeopathy and Core Synchronism have changed my life. First, I was immediately able to breathe after experiencing asthma-like symptoms for years. Many other improvements followed. Elizabeth Battarbee is available via Skype everywhere and in-person in Louisiana! Elise Hensley, LISW, an amazing healer, offers unique psychotherapy services in the Albuquerque and Los Lunas areas at an unparalleled level. EMDR helps with PTSD (Post-Traumatic Stress Disorder) and anxiety of all types. Neurofeedback is a therapy that helps reconnect and enhance your brainpower in all sort of ways to maximize your mental functioning in this complex world of ours. Elise is one of only a few people trained in Neurofeedback in our area. She is someone who is a skilled and amazing mentor. Better yet, your insurance may cover your sessions. This entry was posted in DominiqueNewsletter on October 31, 2014 by intuiti.